Spring is coming, let's bring some bright colors to our wardrobes! How about green? I loooove this color, seriously. And actually, I think it looks great in the winter season as well, so don't hesitate and grab something bright to make your days fun & playful! I've been browsing through my blog posts and realised that I was such a bright colors maniac last year, while now most of the pieces I'm wearing are grey, black or white. I'm not saying that I don't like those shades, I just believe that all those intensive colors really make your everyday life more positive, don't you think so? Last week I received a parcel from Choies and as it's our first collaboration, I wasn't sure what to expect. However, I'm pretty excited about the quality! I've picked this bright green Neoprene top and I'm just loving it. The fabric is just brilliant and the top itself looks so cool, modern and completely matches my style. I'm in love with Neoprene for quite a long time, even some pieces in my future collection are made of it, cannot wait to show you! By the way guys, I'm also wearing my own designed shorts/skorts, so this outfit really means something to me! You can't really see it properly here and I'm good with that as it's still a little secret haha! I'll be interviewed next month by one London magazine about my collection so promise you to tell more! Oh, and also, I'm wearing Edge of Ember accessories, how beautiful they are?? 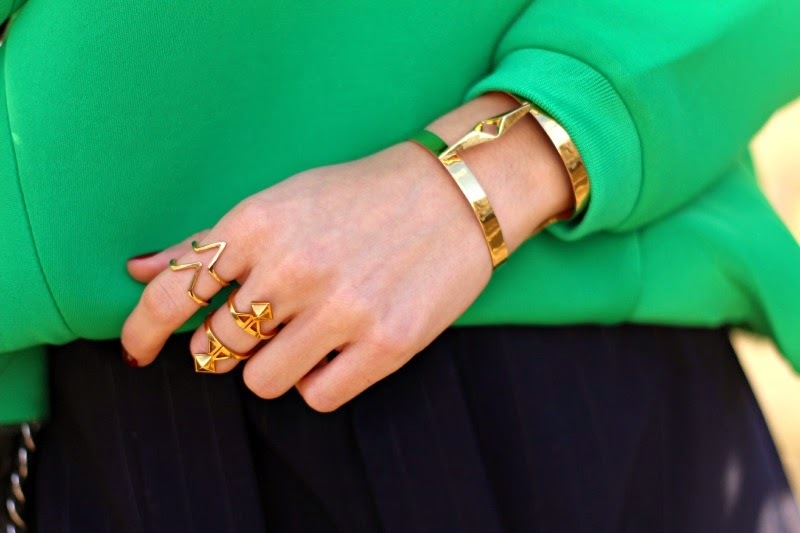 Especially rings, completely my style and look good with every outfit for every occasion, oh yes! Hope you guys liked this look & I cannot wait to hear your comments about it! Love that color on you ! Great shots!